I just love Turquoise! When I visited the Perry Null Trading Company in Gallup, New Mexico, I had the pleasure of touring the vaults and back rooms. There I saw a great variety (and quantity) of turquoise stones. I didn’t know much about turquoise at the time but I knew I was drawn to the stone and the art of the local Native Americans who crafted silver jewelry using the stones from Perry’s vaults. So when I received a recent Perry Null newsletter I especially enjoyed learning more about beautiful turquoise. This article is taken, in part, from the information shared in the newsletter. We know that turquoise is related to copper. It is classified as a semi-precious stone, a material composed of hydrated copper and aluminum phosphate. The more copper in the stone, the bluer the turqoise will appear. I saw veins of turquoise when I visited the Copper Queen Mine in Bisbee, Arizona. Turquoise is found all over the world. However, it is American Turquoise that captures the attention of most collectors and buyers. It has a connection with the Native American peoples that draw many of us to this sacred stone. You can find collectible turquoise from many different Southwest and Western states. In New Mexico, they have the famous Tiffany Mine that produced gorgeous Cerrillos Turquoise and stunning Tyrone Turquoise from the southern part of the state. In Arizona, mines produce one of the most famous American stones, Bisbee. You will also find very desirable Morenci, Kingman, and Ithaca Peak Turquoise from Arizona. To the north is Colorado that produces two very distinct stones, Villa Grove and Manassas Turquoise. It has been said that gem quality Villa Grove Turquoise is some of the best stone ever seen. One cannot leave the state of Nevada out of any turquoise conversation. Nevada is home to several classic American mines that include Blue Gem, Indian Mountain, Red Mountain, Number Eight, Lone Mountain, and Lander Blue Turquoise. 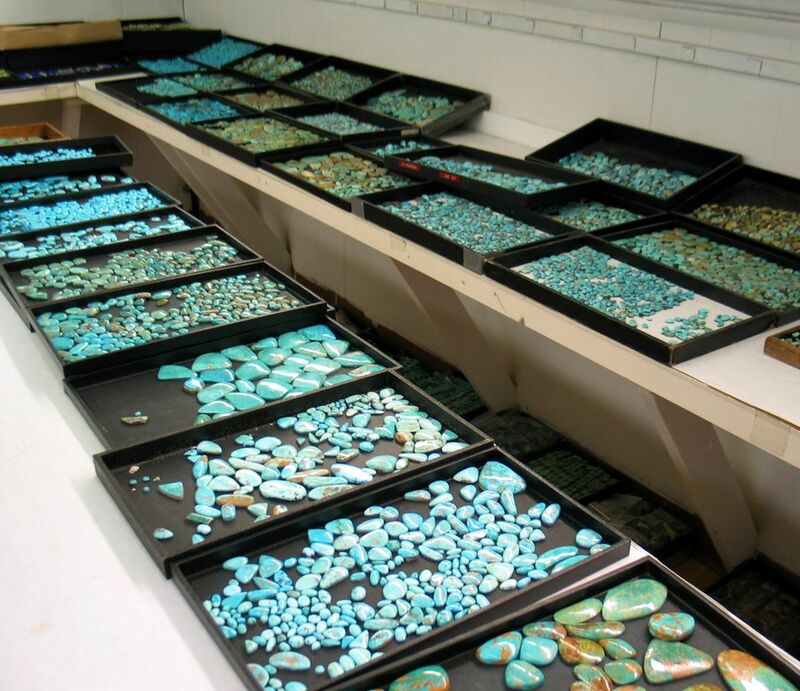 Perry Null, like many of the long-time traders in Gallup, has been buying turquoise for over thirty years. This experience has allowed him to hear many mining stories, and develop the ability to identify and determine a value upon seeing a specific turquoise stone. His love for this stone has led him on a journey that continues today, finding rare and unique American turquoise. In the 1970s', Perry was approached by a turquoise dealer who wanted to sell a large collection of Number Eight stones. This was during the height of the Native American jewelry boom and stone could be a little hard to come by. Almost all the turquoise produced from this special place in Nevada is of the spiderweb-type, with the matrix varying from golden brown to black. Number Eight turquoise of gem quality is considered to be very collectible. During this period $1 a carat stone would be considered very expensive, as compared to today's $100 plus carat cost for certain specimens. Well, the deal was made and Perry now had a collection of fabulous Nevada Number Eight Turquoise Stone. Since that time Number Eight Turquoise has been a favorite of Perry's. When you visit Perry Null's Trading Post in Gallup, New Mexico, you have a great chance to see Perry wearing one of his remarkable turquoise pieces. His showcases are filled with many of the great classic American mines we have come to collect and admire. He loves to buy turquoise, make magnificent pieces of jewelry from his turquoise collection, and wear pieces of turquoise jewelry. So how does a person buy Turquoise? I have found that going to a reputable dealer, such as one of the major Gallup Trading Posts, families that have been in the business for decades, is a good start. Ask Questions. You will want to know that a stone is "natural" and not reconstituted or stabilized. Natural stones come from the earth, and are polished before being set into jewelry. Ask which mine the stones came from and how they were processed. Ask about the artist and get the person's name and the tribe that they come from. Reputable dealers can provide this information, often with a certificate of authenticity for the more exquiste pieces. Arizona State Museum - University of Arizona Campus, Tucson. ASARCO Mineral Discovery Center - Sahuarita, Arizona next to the ASARCO copper mine complex. Heard Museum - Phoenix, Arizona. Maxwell Museum of Anthropology - University of New Mexico campus, Albuquerque, New Mexico. Copper Queen Mine Tour and Exhibits - Bisbee, Arizona. Millicent Rogers Museum of Northern New Mexico - North of Taos, New Mexico. Tucson Gem and Mineral Shows - Sales and exhibits held annually in February. I have to admit that after putting together this article, I am even more hooked on turquoise. I want to visit the museums, spend time in the Trading Posts and read up on this blue wonder. Oh yes, I don't suppose that finding out that turquoise is my birthstone (December) has anything to do with this! Joe Dan Lowry and Joe P. Lowry, Turquoise Unearthed, Rio Nuevo Publishers, Tucson, Arizona, 2002. July 2007 Newsletter, Perry Null Trading Post, Edited by Jason Arsenault.